The beginning of this story is discussed in the first part of our article. Our students’ adventure, alongside chef Mathieu Pacaud, continues here. We have now headed over to meet our student interns and employees at the Hexagone and Histoires restaurants. Chef Mathieu Pacaud opened two restaurants under the same roof in 2015: Hexagone and Histoires, 1 and 2 stars in the Michelin Guide respectively. Mathieu Pacaud trained alongside Éric Briffard at the Plaza Athénée in his role as chef de partie before joining the three Michelin-starred family restaurant, L’Ambroisie. We then went on to visit the Hexagone and Histoires restaurants where, once again, Le Cordon Bleu interns from a variety of training programmes work for Chef Mathieu Pacaud. Roxanne Simpson, from South Africa, who finished her Cuisine Diploma in September 2016, is currently carrying out a 6 month internship. As for Ana Maria Malaver, from Columbia, she finished her Grand Diplôme in 2015 and was taken on full-time at the end of her internship at Hexagone. She now trains her former school’s interns. 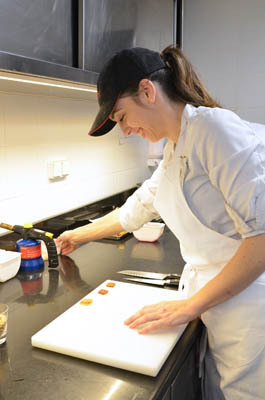 Ana Maria tells us about her journey: "I carried out an initial 4 month internship with Claire Damon, Des Gâteaux et du Pain, which taught me a great deal and was extremely motivating. I was rapidly given greater responsibility. I then went on to carry out my 2nd 6 month internship here, at Hexagone. I am now a full-time employee in charge of entremets, garnishes, and commis. I now train Le Cordon Bleu Paris institute interns, which is part of the job that I really love. I myself was trained by prestigious chefs." As for Roxanne, she works on appetizers and canapés for both restaurants and on starters for Histoires. During our interview she stated “It is an extremely challenging experience, it is important to carry out internships to experience real working life in a restaurant. I am planning on staying in Paris to perfect my French and to carry out another cuisine internship. 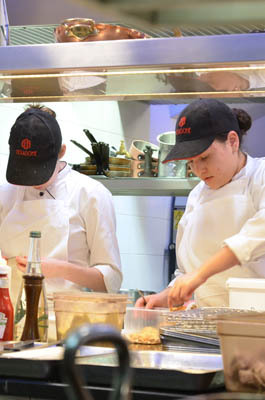 I aim to have a career in cuisine right here, in Paris, because there are amazing opportunities”. A big thank you to Chef Mathieu Pacaud and his teams at Divellec, Hexagone and Histoires for their warm welcome and to the students and graduates who shared their experiences with us.